Some 1st winter (and one 1st summer) birds are depicted on this page. All these birds are fairly typical for this plumage. Most seldom I saw much darker or lighter toned birds e.g. with a more creamy or streaked head. This plumage therefore appears to be a rather consistent one with marginal variation. Variation comes mostly in size. 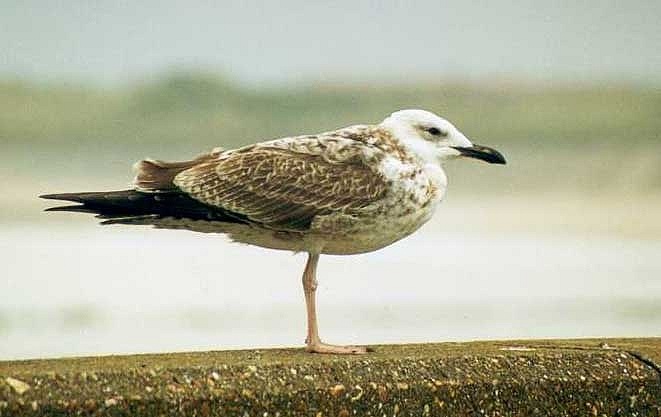 The largest male can easily be larger than any Herring Gull L. argentatus. A typical bird. Note its long and thin legs. Its slender appearance and its small bill suggest this bird being a female. Compare this with the 1st winter below. 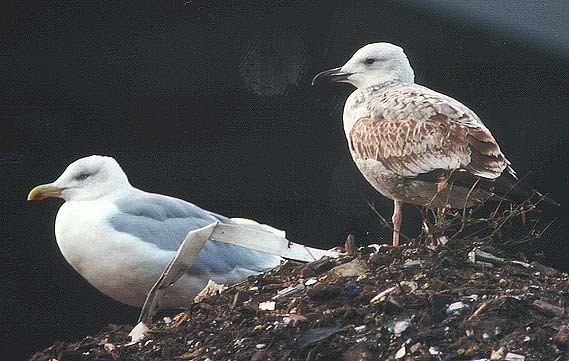 Another 1st winter individual, photographed on the VAM rubbish-dump near Wijster on 24 October 1999. A more rusty-toned bird. Note its firm parallel bill. 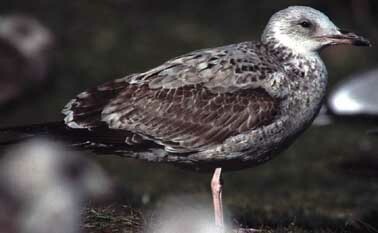 Note also the white head and the typical pattern of the tertials and greater coverts. 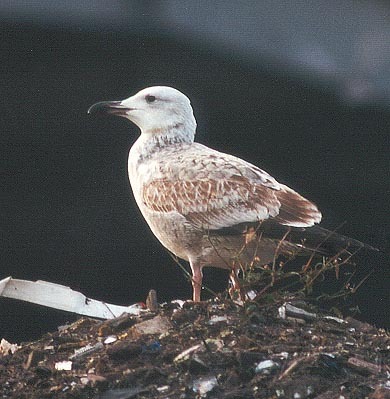 The scapulars have a dark shaft and an obscure anchor and appear very pale, whereas Yellow-Legged Gull L. michahellis normally shows a broad dark anchor, contributing to a darker looking 1st winter mantle. Compare this with the 1st winter YLG depicted below. 1st winter Yellow-legged Gull L. michahellis. VAM rubbish-dump near Wijster, Drenthe, 31 October 1999. 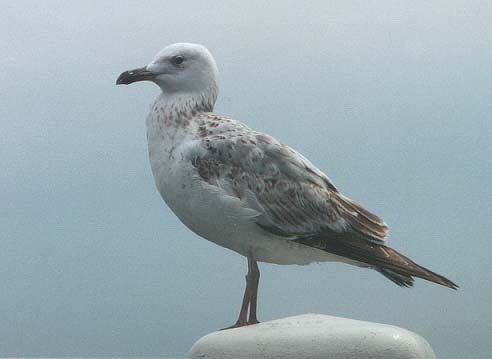 The same Caspian Gull as above. Its headshape is apparently more rounded when the bird is not too alert. 1st winter Caspian Gull. Scheveningen, Nov. 1998. Picture by Nils van Duivendijk. A rather dark individual with a streaked head and mottled underparts. The bill already has a pink base. This can be greenish in some birds. 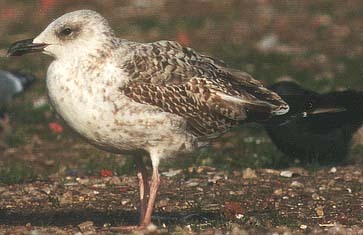 Scapulars, greater coverts and tertials are typical for this plumage. 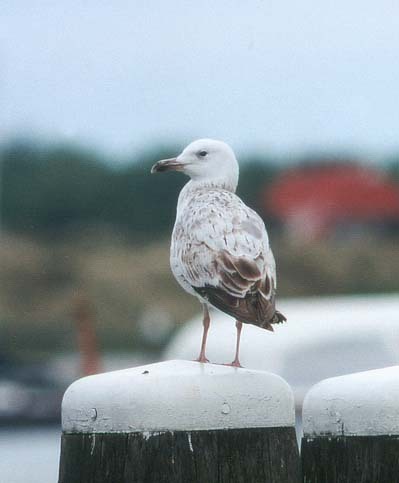 First-summer bird, photographed by Theo Bakker at Terschelling on 16 May 1999. The same bird is depicted below. More Caspian pictures can be found at Martin Reid's website!